The first week of IPL 2019 is perhaps the most eventful week in R Ashwin's career. A mankad in the first game, a big wicket denied by a no-ball due to field restrictions in the second - Ashwin has been in the news for all sorts of reasons recently. What's gone unnoticed amid all this, though, is his performances. As a bowler, and as a captain. Both came to the fore on Monday (April 1) against Delhi Capitals where Kings XI Punjab got out of jail to win from nowhere. The first move by Ashwin perhaps raised many eyebrows, when Sam Curran walked out along with KL Rahul. "I've opened in school cricket, but this is the first time I did in professional cricket," he would say at the end of the game. In Chris Gayle's absence, Curran had the license to do a Sunil Narine for Punjab, and he showed glimpses of that with a 10-ball 20. Punjab only managed an under-par total of 166. It seemed like at least 20 runs short of a competitive total on what was a superb batting surface. However, Ashwin the bowler came to Ashwin the captain's aid. 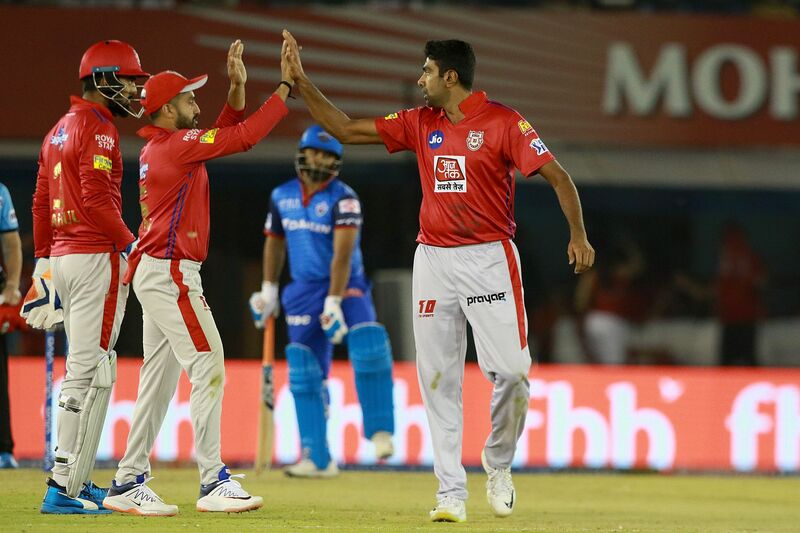 Mujeeb-ur-Rahman's presence meant Ashwin had bowled only eight Power Play overs through IPL 2018. This year, Punjab tried debutant Varun Chakravarthy with the new ball against Kolkata Knight Riders earlier, and the move clearly didn't work as the spinner went for 25, tonked by Narine. Ashwin then decided to take the onus on himself; he opened the bowling against Mumbai Indians and did the same in this match too. Ashwin went wicketless against Mumbai but his 0 for 26 played a part in keeping them in check, and ultimately winning the game. This time around, he got two crucial wickets too. With beautiful drift, he had Prithvi Shaw, who scored 99 last match, nicking behind for a first-ball duck. He then had Shikhar Dhawan trapped lbw with a carrom ball. The low score meant the game was still slipping away, and Delhi needed just 23 off 21 with Rishabh Pant and Colin Ingram in 30s, in the middle of a 62-run stand. But Punjab still had faith, for they knew Delhi's tail was long. "I told the boys to hang in there, I've seen Avesh Khan and Sandeep Lamichhane bat before, their tail isn't strong," said Ashwin at the post-match presentation. Delhi's long tail and wobbly middle-order was on display in the previous match too, before Kagiso Rabada bailed them out with a yorker barrage. They could have chased down the target with just singles and the odd couple, but for some reason they panicked. Pant swung across the line and missed a straight one from Mohammed Shami. Ashwin the fielder then joined the party, running out Chris Morris with a direct hit first ball. Curran then got into the act, kick-starting a night he would never forget. It all started with the well set Colin Ingram holing out to long-off, exposing the tail. And then, panic set in. Harshal Patel slogged and edged. Shami dismissed the last known batsman when Hanuma Vihari slogged and missed a straight one. Ironically, Rabada received a pinpoint yorker from Curran that uprooted his stump. Another similar one in the blockhole got Lamichhane, completing Curran's hat-trick and capping a stunning night for Punjab. Incidentally, death bowling has been the problem for Punjab in the season so far. They ran into Andre Russell in Kolkata, and even in victory over Mumbai, the pacers went for more than 40 runs each. The lack of all-rounders has affected their balance; they're light in the middle order and in bowling. It has forced Ashwin to chop and change almost every match, but Curran's arrival in this game, at the top with bat and towards the end with ball, might just give Punjab the stability they need.